F&W editors investigated hundreds of options to choose the most spectacular gifts, from a great deep fryer to the ultimate cheese board. 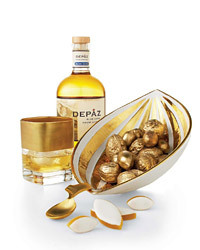 Depaz’s oaky Blue Cane Amber Rhum and rich cane syrup, from a 355-year-old Martinique estate ($42 for rum, $11 for cane syrup; depazrhum.com). Marc Blackwell’s "Northern Hemisphere Florentine Gold" rocks glass is hand-painted with 22-karat gold ($24; 212-696-2827). Blue Leaves’ "Petal Serving Spoon," brushed in 14-karat gold ($26; tabulatua.com). Jonathan Adler’s "Fontana" bowl, inspired by the gold buttons on a Burberry trench coat ($98; jonathanadler.com). G. Savin’s Calissons de Provence almond candies ($16; markethallfoods.com). Oxo’s "Precision Tongs" have a finely ridged tip for grasping delicate foods ($10; oxo.com). La Tourangelle’s fragrant new pistachio and pecan oils are roasted in cast-iron kettles ($24.95 for 250 ml; latourangelle.com). Fred’s "Cool Jewels" ice tray gives "on the rocks" glamorous appeal: It makes ice in six classic gem cuts ($9.50; spoonsisters.com). Kate Spade’s "Festive Peacock" plate, a colorful interpretation of the partridge in "The 12 Days of Christmas" ($22; katespade.com—temporarily out of stock—or bedbathandbeyond.com). Jacques Torres Chocolate’s malt balls are a terrific take on Whoppers ($10 for 8 oz; jacquestorres.com). Sweet Botanicals’ Organic Animal Shaped Jellies taste like pâtes de fruit ($6 for 5.3 oz; foragersmarket.com). Garrison Confections’ big Mint Patty is a refined version of the York Peppermint Pattie ($2 each; garrisonconfections.com). The new Home Thymes line includes a dishwashing liquid and spray cleaner with pleasing scents like mandarin orange ($9 each; thymes.com). British teen Sam Stern’s Cooking Up a Storm ($17) offers smart tips for young cooks (he cautions against salting steaks before cooking since it makes them tougher). Ron Siegel at the Dining Room at the Ritz-Carlton in San Francisco is so enamored of Bolivian rock salt that his restaurant now sells it retail ($35 for 8 oz, including grater; 415-773-6168). Gourmet Sleuth’s masala dabba, a traditional Indian spice box, has two lids to keep contents superfresh ($44; gourmetsleuth.com). Chris Gallagher uses dense woods like Brazilian cherry to make his "Pug" muddler, a pro’s favorite ($35; lenells.com). D’Artagnan’s black- and white-truffle butters are a decadent spread for crackers ($25.50 for 3 oz of black truffle butter, 3 oz of white truffle butter and crackers; dartagnan.com). Casanis Pastis has a smooth licorice bite ($28; 877-205-3803). Rosanna’s "Haute Holiday" porcelain plates with silhouette shapes combine kitschy-cool and luxe ($30 for four; rosannainc.com). Czech designer Maxim Velcovsky’s ingenious "Life of the Snowman" glass sugar dispenser appears to melt as the sugar empties out ($40; momastore.org). The Lobel family, of Lobel’s butcher shop in Manhattan, knows meat better than anyone. In Lobel’s Meat and Wine, they offer wine-friendly meat recipes, plus practical wine pairings ($35). Star chef Daniel Boulud’s one-pot recipes in Braise, ranging from traditional French to Korean, are rustic and refined ($33). In The Kitchen Diaries, British food writer Nigel Slater muses on 12 months of his food life, sharing favorite recipes like creamy orecchiette ($40). Jars Provence, a 150-year-old ceramics company in the south of France, has new "Gravure" plates with a hand-engraved floral pattern ($63; michaelcfina.com). In a dramatic minimalist bottle designed by former Calvin Klein creative director Fabien Baron, Corzo’s Añejo oak-aged tequila has a hint of caramel ($70; corzo.com). Butcher Rick Friar of Seattle’s A&J Meats procured the secret recipe for Hawaii’s famous salty-sweet Maui Ribs more than 30 years ago; they can be shipped nationally ($70 for five lbs; chefshop.com). Architect Kevin Williams’s switch into product design includes everything from motorcycles to the "Node" bowl, in chrome-plated ceramic ($60; cakellc.com). Typhoon’s Italian Job Pasta Machine Set can create four different pasta widths and comes with a beech drying rack ($60; typhoonus.com). Chikurin’s newly imported Taoyaka junmai daiginjo, made with rice brewed on the estate where it’s grown, is exceptionally rich, with anise notes ($80; truesake.com). Pierre Marcolini’s Holiday Star, a large chocolate star, has different fillings (like sugared marcona almond paste) in each of its points, plus 13 surrounding chocolate moons ($85; marcolinichocolatier.com). Perfect Endings’ fluffy Red Velvet Cake, the Southern classic, is the best version we’ve ever tasted ($65; williamssonoma.com). Juliska’s "Isabella" glass pitcher is handblown by artisans outside Prague ($130; juliska.com). Rittenhouse’s 21-year-old Single Barrel Straight Rye Whiskey is the company’s first to be aged in a single barrel ($150; lenells.com). Michael Kramer’s handblown "Orion" nesting bowls for Nouvel Studio come in four beautiful hues ($204 for four; stitchchicago.com). The French company Mauviel now sells its sturdy stainless steel roasting pan in the U.S. (from $210; mauviel.com). Wayne Nish, the chef at March in New York City, has partnered with online cheese shop fromages.com to offer a sublime assortment of French cheeses ($88). It’s an extravagant gift with Peter and Eva Moritz’s cheese knives for BodaNova ($44; 800-279-1602). Art of Tea’s tea-of-the-month club includes pure-tasting varieties like jasmine hand-rolled with green tea to form pearls ($150; artoftea.com). The highlight of Emeril Lagasse’s Emerilware is a deep fryer with a strainer and storage unit for reusing oil ($150; emerilstore.com). Savenor’s butcher shop in Massachusetts (a favorite of the late Julia Child’s) has a new meat-of-the-month club, with tender sirloin steak (from $128 for two servings for six months; savenorsmarket.com).